Your nose is among the most visible aspects of your face. If you’re frustrated with its shape, size, or contours, you might start thinking about getting a nose job, also called a rhinoplasty. Because rhinoplasties are very demanding surgeries that require excellent technical skills and an eye for artistry, it’s essential to do your due diligence when selecting a plastic surgeon. Although it’s possible to revise a bad nose job, doing a little background research now can save you a great deal of frustration later. The plastic surgeon’s credentials are the first things you should check. It isn’t sufficient to ensure that the surgeon is in good standing with the state medical board. The state medical board doesn’t require plastic surgeons to be specifically trained in cosmetic surgeries like rhinoplasty. You should only work with a surgeon who has been board certified by the American Board of Plastic Surgery. This ensures that the plastic surgeon has met exacting standards of clinical knowledge and skills. Plastic surgery is a broad field of medicine, and within it there are many sub-specialties. Since rhinoplasties are technically demanding surgeries, it’s in your best interests to select a plastic surgeon who has performed many of them before. This also helps ensure that your surgeon will have a keen sense of facial symmetry, balance, and aesthetics, honed over years of active practice. 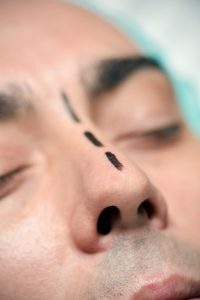 If you’ve previously had nose reshaping surgery, and are seeking a revision rhinoplasty, you should also ensure that the plastic surgeon you choose is skilled in secondary nose jobs. Revision rhinoplasty presents a whole set of additional challenges, and it takes experience to perform them properly. Always check whether the plastic surgeon you choose operates within an accredited surgery center. This is significant because surgery center accreditation reassures you that the operating room is a sterile environment, and all its equipment is up to code. Surgery center accreditation also ensures that the surgeon’s support staff is licensed and have all the necessary qualifications, that your privacy is protected under HIPAA, and that the OR has the necessary equipment and staff to respond appropriately in the event of emergency medical complications. Dr. Thomas Loeb is an award-winning, board-certified plastic surgeon who operates out of an accredited facility in Manhattan, New York City. Among his patients, Dr. Loeb is known for his remarkable sense of artistry and superior clinical skills. Dr. Loeb sparked wide interest in rhinoplasty when he transformed the nose of Paula Jones. Since then, patients have traveled to his Fifth Avenue office from all over the world to seek Dr. Loeb’s rhinoplasty NYC. You can request a confidential consultation with Dr. Loeb by calling 212-327-3700. If you’ll be traveling to NYC for your rhinoplasty, ask us about virtual consultations via Skype. Your patient coordinator can also arrange for personal nursing care at your hotel if necessary.